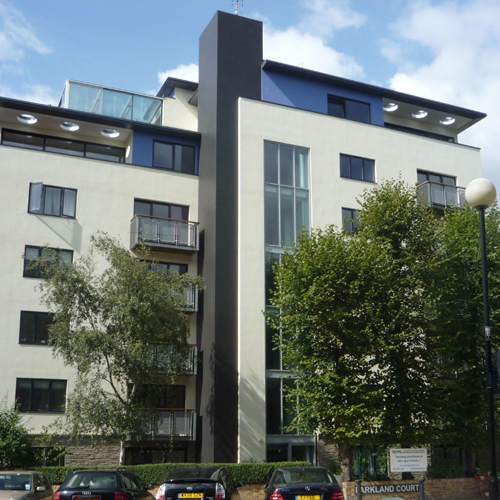 Parkland Court was a flat roofed five storey residential block of fifteen two bedroom Flats in Addison Road; one of London's most prestigious addresses. It was constructed in 1959 and was typical of a large number of residential blocks in London in that it had been ‘maintained’ only and no improvement work had been carried out since it was constructed. It was dated and ‘tired’. The flat roof covering was at the end of its life and the metal ‘Crittall’ windows were poorly fitting and draughty. The brickwork had poor thermal insulation qualities causing significant heat loss and cold bridging internally. The common parts were poor with worn finishes and dated lighting. Fire escape provisions were inadequate. Main services were unable to cope with the increased demand created by modern living. The Lift was continually out of order. Pirton Limited employed award winning architects and added two extra floors consisting of two apartments and a stunning Penthouse. In addition to the new work we refurbished the existing building by covering the brickwork with an insulated render system, replaced all windows and doors with new in double glazed powder coated aluminium, fitted a balcony to each existing Flat, built a new wheelchair accessible lift in a completely new shaft, upgraded the common parts, improved services and carried out landscaping.